Most of the time, lower back pain is caused by a mechanical problem with your spine causing inflammation and nerve irritation. This is a chiropractor’s specialty. Lower back pain can start on the left side of the body, right side of the body, or in the middle of your back. No matter where you feel pain, the cause for each is very similar and will likely involve similar type of treatment to make it better. There can be many different causes for lower back pain. Here’s some different ones. It’s possible your back pain may be caused by a strained muscle. However, this will only last few days at most. Even when you feel muscle tightness or soreness, it’s probably NOT the muscle itself. Instead, it’s probably caused by a malfunctioning spine. A spine that malfunctions will cause tight feeling and achy feelings in the back muscles. *This is a condition that requires medical attention. 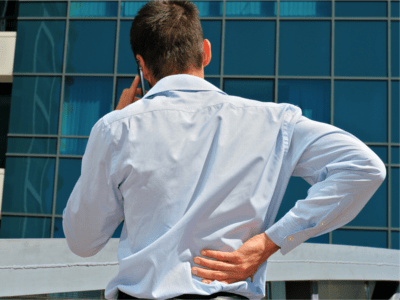 Can Chiropractors Fix Herniated Discs? While chiropractic adjustments cannot directly reduce herniated discs (at least so far as we know at this time), adjustments can help relieve the pains and other symptoms that can come with disc problems. In fact, it is malfunction of the spine itself that can cause disc injuries in the first place. Chiropractors treat patients with herniated discs regularly. Even if you have a herniated disc, it doesn’t mean you’re going to need surgery. Herniated discs can appear without any pain or symptoms in a surprisingly large portion of the adult population. If severe and persistent leg pain is caused by a disc herniation, it’s possible that an injection in that region could help in the short term, and possibly surgical intervention if needed. *In short, if you suffer from lower back pain, and you know, or think you might have a herniated disc, I’d recommend chiropractic care as the first stop. If necessary, a chiropractor can refer for further testing and treatments to help you. Can Chiropractors Fix or Treat Spinal Stenosis? Spinal stenosis is when the ligaments or bone spurs/arthritis impinges on the nerves in the lower back. This is caused by long-standing spine problems. Chiropractors can help by improving the function and strength of the spine. Chiropractic care may be able to help comfort levels, while it also may require surgical intervention if severe. **Urgent medical attention is necessary if you here when you have inability to use your bladder or bowel. The ER is the best place for that. Can Chiropractors Treat or Fix Chronic Pain? Why doesn’t the pain go away? Chronic pain is simply pain that has been there for weeks to months. If you’ve had pain for a long time, that means you’re problem has been there a long time too. If it was going to heal by itself, it would have done so by now. Chronic pain can be in any part of the body. In the spine, it’s often caused by discs and facet joints. You’ve probably injured these joints before, though you may not remember doing so. If so, they may be all jammed up. This locking of your spine causes swelling and pain. If it never got fixed properly by a chiropractor before, then it will take some work because it’s an old problem. So What Does Chiropractic Treatment Look Like? Chiropractors will take a history of your problem, do a chiropractic exam to find out if we can help. Part of this exam may include x-rays. After assessing your condition, if we determine that chiropractic can help you, we will prescribe a treatment plan. Chiropractors treat the spine largely by adjustments. An adjustment is aimed at restoring normal joint motion. Adjustments are usually comfortable, though sometimes they can cause minor discomfort. Spinal adjustments are performed to get your spine moving again. Over time, the inflammation will get less and you’ll feel better. This will take time. Just like a cut on your finger won’t heal immediately, neither will your spine and nerves. You’ll likely start feeling better after 6-12 adjustments. If you have spinal arthritis, stenosis, herniated discs, etc. it will take longer because it’s more severe. Just like chronic pain, if you’ve got weakness or numbness into your arms/legs, these things can take longer to see results. If necessary, we’ll also engage other medical and healthcare professionals. This may include medical doctors, massage therapists, physical therapy etc. Chronic pain takes longer to heal. Most patients feel some change within a few weeks, however good healing and pain relief may take many months, just like shedding an extra 100 pounds of bodyweight won’t happen in 8 weeks. Otherwise, muscle strains and other less difficult cases will heal quicker and not require seeking extra chiropractic or medical attention. Long-term success will likely require maintaining healthy movement forever. These painful areas will probably be “weak spots” for you for the rest of your life. That said, if managed properly by a chiropractor, you’re daily life will be better. Will it hurt to get adjustments? While most chiropractic adjustments are pain free, sometimes adjustments can feel a bit uncomfortable. After your adjustment, you might feel a bit better. You might feel nothing as well. The third reaction is you might feel worse after your adjustment. Luckily, feeling worse is the least common of the responses. Certain spinal exercises will be very helpful in healing the problem. One leg extension: Lie on your back. Bring both knees up with your feet on the floor. Slowly extend one leg straight, then bring it back to the start. Do this 20 times per side. Bird dogs: Go onto your hands and knees. While lifting your left arm straight out in front of you, extend the opposite leg. Then lower the arm and leg to the resting position. Do this 20 times per side. One leg bridges: Lie on your back. Bring both knees up with your feet on the floor. Lift one foot a few inches off the floor, holding it in the air. Use the other leg to push down against the floor to elevate your pelvis. Then relax, bringing your hips back down to the floor. Do 20 times per side. When possible, avoid sitting. If you have to sit for work, stand up once every 10 minutes. If you drive for a living, move your pelvis and lower back as much as you can in your seat. There is a a special device you can use to help with this (contact our office for more info). Avoid leaning forward at the waist. This usually increases lower back pain. Take a break from workouts until your lower back pain or neck pain is feeling much better. We will often recommend you ice for 10-15 minutes, 3-4 times per day. This is best done when you’re really hurting. It can help provide local numbing effect. There are conditions that seem to work better with heat. If ice doesn’t help, I’d try a bit of heat. While we don’t recommend medications, they can be useful in the early stages to help manage pain. Anti-inflammatories (like Aspirin) can be useful in reducing inflammation at the source. We recommend that you check with a pharmacist if you’re on any other medications, or have other conditions where taking these could be harmful. In our opinion, muscle relaxants may feel good, but could aggravate the problem. Muscles spasm up to help guard and protect your injury. If you make those muscles relax, it could cause more of a problem. We treat inversion tables similar to drugs. They can be helpful in the short-term to help relieve initial pain, but they aren’t a replacement for proper chiropractic care. They don’t really fix the cause of the problem. While there’s a lot of gimmicks in the treatment of low back pain, the cause is usually related to your lower back malfunctioning. Chiropractors are specialists in this arena. We can do a thorough examination of your problem to see if chiropractic can help you.